✴The Benedictine Monastero di San Paolo delle Abbadesse was formed in ca. 1180. It became very rich, and received a series of papal privileges, most notably from Pope Innocent III in 1201. St Clare took refuge here in ca. 1211, after she had left home to begin her religious life. The nuns defended her from her family, although they found it prudent to ask her to leave after a few days and she went to Sant’ Angelo in Panzo on Mount Subiaso. ✴A community of female penitents settled at the Eremo di Sant Apollinare, on the other side of the river, in the early 13th century. In 1229, Pope Gregorio IX gave allowed them to exist under episcopal jurisdiction. In 1264, the sisters acquired land on this site in Assisi, which was then outside the walls. However, the nuns of Santa Chiara opposed their move, and Pope Clement IV decreed that other religious foundations could not be established within 300 canne from their church. (A canna was about 2 meters). Thus the project to build the new nunnery had to be suspended until 1286, when Pope Honorius IV reduced the “exclusion zone” around Santa Chiara to 140 canne. The bull of Honorius IV records that the community of Sant’ Apollinare followed the Benedictine Rule by that time. The nunnery, now the Monastero di Sant Apollinare, was subsequently enclosed within the new city walls (begun in 1316). In 1330, the nuns of San Paolo delle Abbadesse decided to move to this site, and planned to build their new church on the "platea" that belonged to Sant’ Apollinare. In 1341, Bishop Nicolò of Assisi intervened in what had become a lengthy dispute, and decreed that the church of San Paolo could be built with one wall balanced by the wall of the Monastero di Sant Apollinare. This shared wall was damaged (perhaps in an earthquake) in 1411, and there was another acrimonious dispute about the cost of its repair, but the two communities seem otherwise to have co-existed in reasonable harmony. Giovanni de Acetis de Cormaianico deposed Emilia Antonii Franceschini de Fluminibus as abbess of San Paolo in 1442, citing the "inhonest morium" (dishonest customs) of the community. 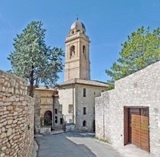 The property of San Paolo and some of its nuns transferred to Sant’ Apollinare, while the ex-abbess and the rest of the nuns were moved to other nunneries in Assisi. Some of them joined the female penitents in the Monastero della Benedetta in 1453. The nuns of Sant’ Apollinare sold a plot of land in ca. 1447 for the new Franciscan Monastero di San Quirico. Sant' Apollinare was suppressed in 1866 and the nuns bought the ex- Monastero della Benedetta in 1881. The Benedictine nuns from San Giacomo de Murorupto bought the present site in 1897, and re-dedicated it as the Monastero delle Benedettine di San Giuseppe. The nuns still use the church of San Paolo for their services. They also offer accommodation in their Foresteria. The facade of the two churches are at right angles, with that of San Paolo to the left. The line of the Roman wall ran through the garden of Sant’ Apollinare, and the 14th century circuit ran around its perimeter, towards Porta Sementone (at the end of the street on the right in this photograph). This fresco in the lunette over the portal of the church of San Paolo is somewhat tenuously attributed to Dono Doni. The church of Sant’ Apollinare had a choir scrren across the choir that separated the nuns from the congregation in the nave. 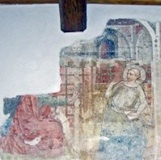 By the time of the Apostolic Visit of Monsignor Pietro Camaiani in 1573, the latter had been adapted as the parlour of the nunnery, and some of the frescoes had been damaged in the process. Others were damaged when a wooden ceiling was installed. The nave now serves as the reception for the Foresteria (accommodation for visitors). ✴the third (particularly badly damaged), which depicts the stigmatisation of St Francis, is attributed to Pace di Bartolo. This cinerary urn, which was found in the garden of the nunnery, is now exhibit 166 in Museo Civico. This panel from the nuns' choir, which is attributed to the Maestro Espressionista di Santa Chiara, is now in the Pinacoteca Comunale. It depict Christus Patiens with the Virgin and St John the Evangelist: a small figure of St Apollinaris kneels at the foot of the Cross.